Our language professionals translate exclusively into their native tongue. They are fully certified and qualified with an extensive professional experience.We translate to and from all European languages. Polyline Translations provides translations for both private and public sector companies, professional and law firms and governmental organisations from and into any language in a wide range of fields. Once completed, every project undergoes a quality control procedure carried out by a Project Manager, who coordinates the workflow with translators and editors who enable us to guarantee the consistency in terms of style, syntax and terminology for a perfect adherence to the original text. Perfect synergy of our highly qualified translators together with their technological expertise, allow us to guarantee punctuality in term of reliability for delivery date. We offer a wide and complete range of services together with linguistic solutions which can maximize your commercial choices and help you achieve a greater success in the global market. Our prices are fair and transparent and reflect our reliability, quality and efficiency in performing translations. 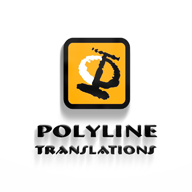 Polyline Translations guarantees that all translations and informative material, supplied by the client, remains strictly confidential. We also require to our translators, interpreters and proofreaders to sign a confidentiality agreement, that it is expressly forbidden to pass on any personal data or any of the content of a translation to third parties. Our language professionals translate exclusively into their native tongue. They are fully certified and qualified with an extensive professional experience. Polyline Translations provides translations for both private and public sector companies, professional and law firms and governmental organisations from and into any language in a wide range of fields.